ATTENDANT'S PLATE: As bright and fresh as a flower garden, this plate is a favorite with brides across the USA. 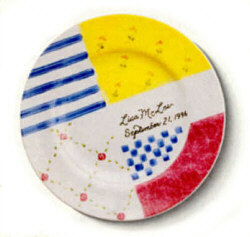 This pretty china plate is hand painted in floral and stripes and personalized in 24 karat gold. Your attendants will love such a personal gift which can be ordered with your personal message. Great idea for a thank you gift to those who hosted your bridal showers and for the bride's and groom's parents! This plate comes in your choice of two sizes: 6.25" and 7.5". 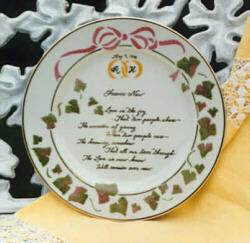 WEDDING PLATE: This 9.25" bright white porcelain plate is embellished with IVY, the symbol of loyalty and devotion. It is topped with a perky bow coordinated with your wedding color scheme. To complete the scene, the bride and groom's initials and the wedding date are lavishly portrayed in 24 karat gold within double wedding bands! What a treasured gift and for a small additional fee a favorite short poem or verse can be written in gold in the center! ATTENDANT'S MUG: As soon as you lift this porcelain mug to your lips you will immediately know why porcelain is the preferred choice over ceramic. 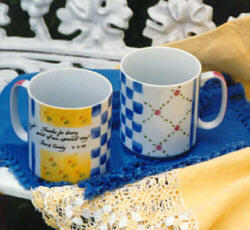 Decorated in the same floral and stripes as the attendant's plates, and personalized in 24 karat gold, this hearty 12 oz. oversize mug makes a great gift for the men too! The attendants' gifts listed above are designed to coordinate with our Patchwork Dinnerware Collection. Patchwork is a china service that's whimsical beauty is truly transitional. It is as much at home in the morning at the kitchen table as it is at a dinner party where it will become a lively conversation piece. The plates and bowls are designed for stacking ability to reveal an enchanting array of design combinations! This table service is truly a work of art. Find this dinnerware line and others on our Dinnerware and Tabletop Accessories page at this web site. "My bridesmaids loved the personalized, hand painted plates. The gift told each how special they were to me. It was a perfect wedding day memento." Lynn of NJ. "I gave three of my sorority sisters, who were all brides, your lovely personalized plates. Each one has them displayed in their homes - and everyone comments on their unique design." Karen of MD. "My bridesmaids loved receiving a unique, handmade gift designed especially for them." Lisa of NY. "I had the hardest time finding appropriate gifts for my bridesmaids, but your personalized plates were so unique and elegant - They were perfect! And they were the hit of the rehearsal dinner." Cathe of CA.